As the season rapidly approaches the SoxProspects.com staff continues to update scouting reports on players down in Fort Myers. Both Bobby Poyner (pictured), and Jalen Beeks received updates to their player pages. Though most of the Red Sox roster is set, there are some questions as to who will round out the bullpen staff. Rob Bradford of WEEI says that manager Alex Cora will not necessarily carry a left-handed reliever and will take the best arms who can get outs on both sides of the plate. 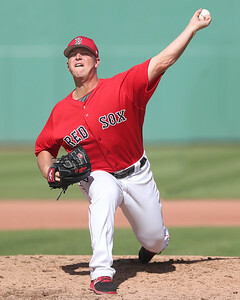 Bobby Poyner (pictured) has been throwing the ball well and, despite not having pitched above Double-A, is in consideration along with Robby Scott and Heath Hembree, should Cora decide to carry a left-hander. Bradford also reported that Brian Johnson will likely pitch on April 2, Boston's interleague opener against Miami and if Eduardo Rodriguez or Steven Wright cannot pitch in their series with the Rays, Hector Velazquez will slot in their place. Eric Gomez of ESPN.com wrote a feature on Esteban Quiroz, a diminutive infielder from the same town in Mexico as Velazquez. Quiroz, who signed with Boston in November 2017, is currently ranked No. 44 in the SoxProspects.com rankings. Over The Monster compiled an organizational depth chart for outfielders and after the major league section, explored some prospects, including Cole Brannen. They did the same thing for infielders, with Micahel Chavis getting focus as the top infield prospect. The Red Sox signed left-handed pitcher Isaias Ozoria to a minor league contract on March 19. Cole Brannen and Alex Scherff have yet to be scouted in person by the SoxProspects.com staff yet, but their short scouting reports have been updated. As part of MiLB's "Es Divertidos Ser Un Fan" (It's fun to be a fan) initiative to engage fans across wider demographics, the Pawtucket Red Sox will become the "Osos Polares de Pawtucket", or the "Polar Bears of Pawtucket" for every Tuesday home game this season except for July 3. While not minor league news, the Red Sox and Yankees look poised to play a series in London in 2019.